What Adaptations Do Zebras Have in Their Habitats? Zebra have adapted to their habitats in several ways. These include adaptations in their anatomy, physiology and even their behavior. Some adaptations serve to discourage predators and parasites. Others help them feed and take advantage of food sources. These adaptations range from the obvious, like their stripes, to more subtle adaptions, like their herding behavior. A zebra's stripes probably catch the eye more quickly than any other adaption. However, these stripes serve several purposes. This includes "dazzle" camouflage. Unlike other forms of camouflage, dazzle camouflage does not hide the zebra. Instead, it breaks up his outline and makes it harder for predators to judge distances -- throwing off their strikes when hunting. 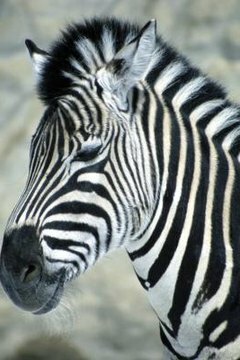 Additionally, the stripes might confuse certain parasitic flies, since the zebra's patterns don't resemble other mammals from a fly's-eye-view. Zebra have several types of teeth that help them survive in their habitats. In the front of their mouths, zebra use their strong incisors for biting off grass and other vegetation. In the rear of their mouths, zebra have molars and premolars to grind down their food. Unlike other mammals, zebras feature large, high-crowned grinding teeth, since many of the grasses they eat feature a high silica content that can wear down teeth. Additionally, males have enlarged canine teeth for fighting. This adaptation is the result of sexual selection; males that perform better in fights have a better chance of getting a mate and reproducing. Zebra feature several adaptations to their digestive tracts to better use the foods in their environment. Like other members of the horse family, most of the digestion occurs in an organ called the cecum. The cecum is a blind pouch off of the beginning of the small intestine, right after the stomach. Here, bacteria help break down the zebra's food before the body can absorb it. This allows food to pass more rapidly through a zebra's digestive tract. This adaptation has several pros and cons for zebra. On one hand, they can get useful nutrition from poor-quality grasses, helping them find food in areas other animals can't. On the downside, they need to eat more grasses to get enough protein, forcing them to eat for more of their day. Not all adaptations involve physical structures. Zebra have several behavioral adaptations in addition to their physical adaptations. For example, most species of zebra live in herds, like other members of the horse family. Unlike most other horse species, zebra often herd with other animals as well, such as giraffes. While this behavioral adaptation offers many of the same advantages for all herding animals -- such as more eyes to spot predators -- living in groups enhances some other zebra adaptions. In groups, the stripes help break up their outlines, making it harder for predators to pick out the shape of individual zebra. This benefits all members of the group. Even the Grevy's zebra, which does not live in true herds, still tend to form small groups that can offer some of the same advantages. How Many Zebra Species Are There? What Are Some Adaptations Where a Zebra & a Horse Are Different? Why Do Angelfish Chase Each Other?